The Universal Service Obligation (USO) ensures access to voice communication services for all Australians. The obligation has changed very little in comparison to the telecommunications market and consumers? use of services. This presents a number of gaps and risks for consumers, as safeguards do not exist for the communications services that are used today, such as data and mobile services. However, updating the obligation to include these services alone will likely fail consumers. Furthermore, focusing on distributing resources does not take into consideration the resulting outcome for consumers; how they utilise the opportunities that they have; or the barriers that they may face. This paper outlines the imperative for action in this area and argues for a new framework based on a principle of contactability. This new framework will have four key areas: availability, affordability, accessibility and service standards. A further two areas; online service delivery and literacy and empowerment, are also needed to fully ensure contactability is achieved. The Universal Service Obligation (USO) guarantees reasonable access to a standard telephone service (STS) and payphones to all people in Australia on an equitable basis, wherever they reside or carry on business (Telecommunications Act 1999). The obligation was set out in legislation, but is now delivered by alternative contractual arrangements between the Government and the Universal Service Provider (USP), currently Telstra (Telecommunications Act 2011). There have been a number of changes to the telecommunications market in recent years which make it an ideal time to re-examine how and what telecommunication services are guaranteed to consumers. One of the main drivers is the Government decision to implement the National Broadband Network (NBN), delivered by nbnco (the company), to provide all premises with access to superfast broadband (capable of greater than 25Mbps). This has resulted in a policy of separate network and retail telecommunication services and a desire for competition at each level. Furthermore, the Regional Telecommunications Review (2015; 44-54) noted that safeguards are needed to expand beyond the guarantee of ?increasingly irrelevant? voice services. It recommended that a new Consumer Communication Standard for voice and data be developed. This Standard would be technology neutral and better address availability, accessibility, affordability, performance and reliability issues. It would also be subject to transitional arrangements, with grandfathering provisions (maintenance of the current obligation while the new obligations will apply going forward) to protect consumers who are still reliant on legacy services. This document will not attempt to provide a history of the USO, summarise all the relevant documentation or outline issues with the current situation in Australia (for the detailed background see Grant & Raiche (2012) and Corner (2012)). Rather it will provide an argument for why there needs to be a change, and how this might look. for social networking, interaction and communication (94% used the Internet for emailing, 69% of Australians used the Internet for social networking). However, many consumers are being let down by not being able to access services that they require to perform these necessary activities. Often the service required is not adequately available, particularly for regional and remote consumers. The Department of Communications (2013) stated that 13% of premises had inadequate or no access to fixed broadband services. Accessibility and reasonable affordability are considered to be key aspects of the USO, with some obligations to address these barriers placed on the USP. However, consumers still face accessibility and affordability barriers, and issues with quality of service standards. Accessibility of voice services has been traditionally addressed through the provision of accessible equipment ? tele-typewriters ? to enable people who are deaf or have a hearing or speech impairment to communicate. Telecommunication services, particularly data services, are expected to address many barriers faced by Australians with disabilities. The National Disability Strategy (Department of Social Services 2011; 27) states that the NBN ?is capable of enabling Australians with disability and their carers to access a range of benefits including e?health services, remote monitoring for assisted living, interactive learning opportunities, employment opportunities, increased connectedness within the community, and improved access to communication services?. Such services come with a hefty price in terms of the cost of equipment and data allowance, support for which is not currently addressed through the obligation or Government support programmes. Affordability is a known barrier for broadband services. Nationally the penetration of households with Internet is currently 83%, with access falling to just 59% for households with incomes in the lowest 20 per cent (ABS 2014). Current indications are that broadband affordability will become an increasing concern, as NBN products last year showed a real price increase of 4.6%, while the cost of other telecommunication services decreased (ACCC 2015). De Ridder (2013) estimates that without entry level retail pricing ?there will be 250,000 fewer broadband customers.? The USP is required to have low-income options. However, this does not provide consumers with a choice of providers offering low-income products. Furthermore while some welfare beneficiaries can claim an allowance for the telephone, ?most curiously, it is not available to those on the poorest payments such as Newstart and Youth Allowance unless they have dependent children, are over 60 or have limited capacity to work? (SACOSS 2015). De Ridder (2015) demonstrates the potential risk as he estimates that about a million households currently face issues of affordability and are in need of support, but not all qualify for it. The Allowance also only provides for ongoing costs and not the sometimes hefty upfront costs of the devices used for getting connected. Current connection and repair timeframe guarantees only apply to the delivery of voice services, and service reliability standards do not apply to all networks. Consumers do not have guarantees in relation to service standards for data services. Complaints in relation to fully unusable Internet services and delays in connecting Internet services have increased (45.7% and 41.5%, respectively) in the quarter to March 2015 (TIO 2015). There is a risk to consumers from not having guarantees on these services. Clearly, there is a gap in the provision of the voice and data services that are required in order to participate adequately in modern society. Some consumers are also at a disadvantage due to affordability and accessibility barriers and due to lacking service and reliability standards. Since 1991 the Australian telecommunications market has been transformed from a monopoly provider, capable of offering a complete or end-to-end service, to a market with different network infrastructure layers and service providers. When providing a universal service, a number of requirements need to be met, primarily at the network level. It was easier to obligate the provider to offer everyone a service under the old model. The complexity of the market today presents a number of issues which limit the effectiveness of updating the current system. What is a data service? The delivery of voice services under the USO is based around a technical standard (CA 2004) which the service must meet. There currently is no similar standard for a data service. The Government initiative of the NBN, to deliver 25Mbps downstream to every premises and 50Mbps to 90% of premises (NBN 2014), only sets out a speed that the network should achieve and not what a data service to every premises should be. This is evident by nbnco selling lower speeds, at 12Mbps downstream. It creates geographical inequity as not all premises will receive the same standard, as the company needs to meet target coverage rates, not to provide everyone with a universal service. The promise to deliver 25Mbps downstream also does not take into consideration what people can do with the connection, which is dependent on other technical features such as upload speeds and latency, which have no set requirements. Minimum technical standards which the services must meet need to be established, to ensure that the services are offered equitably across providers, technology platforms and geographical areas. At what level, network or retail service, should a data obligation apply? The purpose and interpretations of what the USO obligation provides varies. Traditional availability addressed the lack of a network, which is the most expensive part of providing a service. Telstra, the current USP, is of the view that ?the USO is a retail service provision obligation designed to provide a safety net for customers at a retail level, not a wholesale infrastructure obligation? (Telstra 2015; 11). Through NBN, legislation, and the carrier licence conditions, every premises will have access to a broadband network which offers services to retailers, on a non-discriminatory basis, at a capped price (Department of Communications 2014). There is no obligation on retailers to provide services over these networks. It is not clear if some premises will have access to a network but not a retail provider, for which an obligation would be required. What role do mobile services play? Mobile services are important for safety and convenience, and may be preferred to fixed broadband by many low income consumers. Of households with incomes of less than $40,000, 23% had mobile-only broadband, compared to 9% in households with income over $120,000 (BCR 2015; 55). However, there are large areas of Australia which have no or poor mobile reception. In the first round of the Mobile Black Spot Programme, 6,221 mobile black spots were identified (Turnbull 2015). Mobile services can deliver voice and data services, but an updated USO might not address mobile coverage issues. A provider obligated to provide data services would be able to choose the technology to use and might not address mobile coverage issues, particularly along highways and other non-premise areas. Is the USO the best mechanism to address all barriers? There is a myriad of barriers to broadband that a consumer may face. Other countries are increasingly moving away from updating and declaring new services as universal services in favour of using other complementary mechanisms. Ofcom (2010; 4) stated that availability is an issue ?but it is by no means the only one and some of the challenges are not easily addressed via the USO requirements?. Placing an obligation on one provider to address all barriers may not be the most effective method. It also removes consumer choice and power. For example, a consumer who needs assistance with special equipment should not be limited to the service provider and plans from which they can choose in order to avail themselves of such equipment. A number of targeted funding programs may be more effective to address barriers such as affordability and accessibility. With the complexity and the new opportunities that the telecommunications market presents, and the services that are required by consumers, it is time for the USO to be re-examined. The following section will outline a suggested new framework to approach the USO, which would deliver more value to consumers. Communication services can be seen as an enabler for consumers to perform a variety of functions, rather than delivering value by themselves. Therefore they should be judged on how well they are utilised for the capabilities that they deliver. A contactability framework considers what a consumer can do, based on a theoretical framework, the capabilities approach, developed by Nobel Prize winning economist Amaryta Sen (Sen 1999). The capability approach was originally used in development studies to understand the causes and consequences of not having opportunities to ?do? and ?be? what is of value to the individual, due to external causes such as poverty or racism. It highlighted that development should be a method to promote an individual?s capabilities, and should be evaluated according to its impact on people?s capabilities. For example a programme to teach school children to read should not just be evaluated by its means, e.g. how many children attended class and passed exams, but by how this impacted on these children?s capabilities ? such as being literate, empowered, connected and later accessing jobs. This approach is useful as it is applicable across political, economic and cultural borders. People can choose to do the things they want to do when they have the resources available, as well as the environmental and personal characteristics that allow them to perform these actions. Garnham (1999; 113-124) argues that a capabilities approach to communications results in a state of ?contactability?, the absence of which results in a loss of functions, inhibits participation in social life and the labour market. For consumers in Australia, contactability means the ability to ensure personal safety, self-progression and personal development, completion of online tasks, e-commerce and economic livelihood, success and well-being and social networking, interaction and communications. Working backwards from this, the level of service required to ensure these capabilities is a voice and data service that offers a minimum level of availability, affordability, accessibility and reliability. 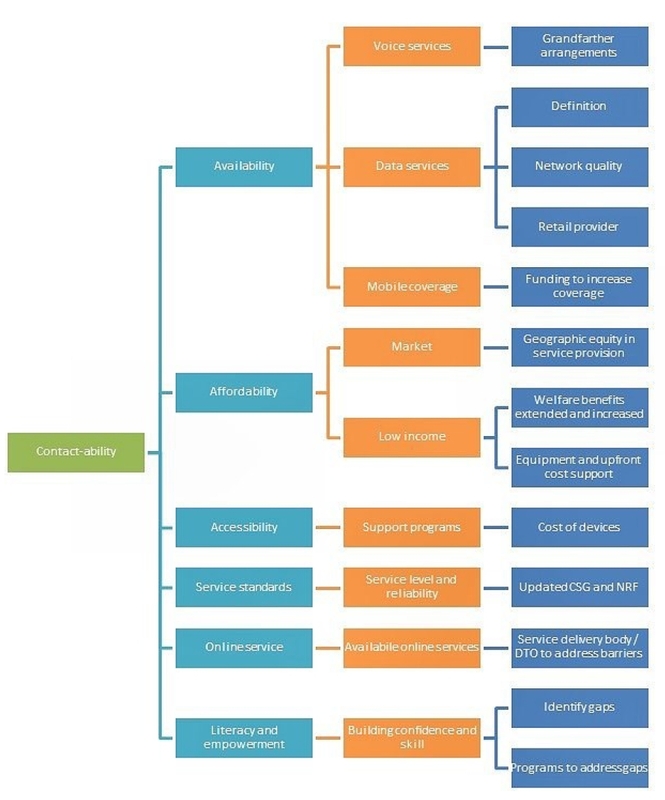 The following chart and sections outline each of these key requirements and suggests elements, methods and tools which could be used to improve contactability. As discussed above, consumers need access to voice and data services in order to perform the many functions which communication services enable. Furthermore, as communication no longer occurs in one place, an element of mobility needs to be included. The delivery of voice services occurs increasingly through mobile and Internet platforms. Other countries, such as the UK, are currently debating the removal of obligations related to the delivery of voice services through their national legacy network (Telegraph 2015). After the completion of the NBN network rollout, most voice services in Australia will be delivered over Internet applications. However, there may be a number of consumers, particularly during the interim period and for those receiving NBN services over satellite technology, who remain reliant on the delivery of voice services through the legacy network, i.e. the Public Switched Telephone Network (PSTN). The obligation to provide voice services should be grandfathered to protect consumers who continue to rely on these services. It is likely, with time, that this obligation could be removed, once there is evidence that all consumers have access to similar or better alternatives. The term data service can describe many activities, including voice and video conferencing, emailing, web browsing, accessing government sites and video streaming. A technical minimum level of service appropriate to the required level of data services needs to be established. This would be achieved by examining what the service is required to deliver and designing the standards around it. It could be updated if the level of service needed increased over time. Consumers require a network to meet certain standards to carryout functions, such as minimum speeds for uploading and downloading and latency for voice and video calling. Providing a network that cannot meet these will limit consumers? capabilities. As nbnco, or a competing wholesale broadband infrastructure provider, will be connecting every premises, it is logical that quality standards at the network level should apply. It is unlikely, and in some cases not possible, that more than one network will service some premises. Consumers for the most part will not have a choice in the network that is used. Therefore technical standards should apply through legislation or regulations on carrier licence obligations to ensure that a minimum standard of broadband network access performance is available throughout Australia. Ireland?s Broadband Intervention Strategy has proposed minimum standards delivered at the wholesale level for: minimum download speed (30Mbps), minimum upload speed (6Mbps), latency (no more than 25ms), jitter (no more than 25ms), packet loss (not more than 0.1%) and network reliability (of at least 99.95% of the time) (DCENR 2015; 19). The strategy aims to promote strong retail competition. Standards in terms of similar specifications should apply to all wholesale broadband networks in Australia. The level of speeds typically offered by service providers are peak capabilities rather than what is always achieved. Therefore a minimum speed, Committed Information Rate (CIR), per premises is also required. The provision of wholesale broadband network access in Australia, where retailers must be offered non-discriminatory price-capped access, should be priced to ensure that it is commercially motivating for retailers to offer services in all areas. However, there are other costs to the retailer in supplying services, such as costs to connect to the network (backhaul), which may threaten this. In the first instance nbnco and the Australian Competition and Consumer Commission (ACCC) should address market issues that result in geographic inequities amongst retail providers. A retail provider of last resort for data may be necessary. Decisions made by retailers can also affect the quality of data services for consumers. However, if network quality standards are met and consumers can make informed decisions regarding which retailer to choose on broadband performance, then a minimum level of service at the retail level should not be required. Even where mobile services could be used to fulfil the obligation of delivering data services under a revised USO, it is unlikely that this would result in market-driven increased mobile coverage, as USP providers can fulfil their obligation at a lower cost through other available networks (i.e. Telstra copper and NBN). Therefore mobile coverage is likely to remain an ongoing concern, and it is unclear how long the Mobile Black Spot Programme can continue to be indefinitely funded. As coverage extends further into less populous areas, the cost of extending mobile coverage increases and the potential return to the provider decreases. It is important for the public good that the mobile networks do extend their coverage further, and that a collaborative approach and utilisation of all available infrastructures is used, to reduce the cost of public subsidies. The extension of the mobile networks should ensure open access wholesale mobile coverage, i.e. re-selling a network to other providers. This is in the best interest of consumers, as it provides choice and competition in rural areas. Further targeted funding measures should be used to address mobile coverage gaps particularly along roads. Affordability is a consumer?s ability to pay for and use telecommunications without sacrificing expenditure on other essential services and items (Lewin & Milne 2010). It is particularly an issue for those who are vulnerable to higher costs. It should be ensured that affordability is not a barrier to communications services. Existing Government-funded subsidies for low income consumers need to be re-examined to include a wider range of at risk citizens, and updated to reflect the essential role and cost of basic broadband telecommunication services. The ongoing cost may not be the only barrier or immediate affordability concern. Whether upfront or ongoing costs represent the greater barrier to usage should be examined. A review of the US subsidy scheme for telephone services found that support for initial connection (Linkup) increased penetration to a greater extent than ongoing monthly support (Lifeline subsidy). It was more effective as it encouraged consumers who had no connection to take up services (Ackerberg et al 2013). Furthermore, the low-income households surveyed were found to value higher assistance with upfront costs more than assistance with ongoing costs. At the moment the Australian USO framework does not address the basic needs of consumers who require additional equipment in order to use data services. Mobile and fixed broadband data services, and the associated equipment, may inherently better meet the needs of consumers with accessibility issues. For these citizens, the cost of the additional devices needed can be significantly more than for average consumers. There are no policies or programs which recognise or provide broadband communication support for these users. If telecommunication services are to be used to address social inclusion issues and to improve service delivery and health, then the equipment supply and the costs of being connected need to be addressed through targeted programs. Standards should apply to communication services in terms of reliability, connection and repair timeframes. These standards should apply across all networks as this would ensure that there is consistency in the delivery of services to consumers for telecommunication services. The implementation of this would take the form of an update to the current standards: the Customer Service Guarantee (CSG), which applies to the connection and repair timeframes for the standard telephone services, and the Network Reliability Framework (NRF), which relates to fault repairs on the Telstra copper network. The new Consumer Communications Standard should ensure that a minimum reliability standard is achieved by networks. Consumers may have no choice about the wholesale network that services them, because it may be an effective monopoly; therefore it is important that these minimum connection, repair and reliability standards apply to all networks. While consumers deal directly with retail service providers, it is important that incentives and accountability apply to the body which is responsible for delivering the network services. Telecommunication providers and the NBN will increasingly be relied upon to deliver other services, such as education and Government online services. The latter is seen as a better method to interact with citizens, and produces cost savings to the Government from doing so. However, usually there is not a prior assessment made of the ability of consumers and the network to use and deliver these e-Government services. One suggested approach could be the use of zero rating for Government websites (i.e. data is not charged for using these sites). However, this would need to apply to all plans and providers, including mobile networks, to ensure equity, which may present a challenge. The Digital Transformation Office (DTO) and the body delivering the service may be best placed to establish systems to deal with the delivery of these services. They are better equipped to know who the relevant people are and the level of service and equipment required. Furthermore, this would require the governmental agencies to design their services with the consumers? ability to use them in mind. If the delivery of online services requires the use of special equipment, e.g. for disabled citizens, then the agency concerned should provide support for the purchase of this equipment. As a further example, the cost of equipment for school age students should be considered and programs to address the affordability of these designed, such as providing an increased child benefit for school age children. Once consumers have access to services, can afford them, and any further accessibility barriers are addressed, then they must have the ability, skill and confidence to utilise the services. Lack of confidence, lesser ability or fear of the technology can be a barrier to its use. This is a complex barrier that is hard to measure or overcome. It is increasingly important that consumers are informed and feel empowered by technology and communication services. It is important that consumers realise the benefits of communication services. Further study is required to identify barriers to usage in consumers? attitudes to communication services. Programs may need to be developed which try to address the gaps and build consumer confidence, both in their user skills and the workings of the technology itself. Broadband communication services are increasingly the biggest enablers for consumers to be capable of carrying out a large number of essential work, home and lifestyle activities. The benefit from having and using good broadband services can impact on almost every aspect of life. However, consumers in Australia are at risk from not having access to these essential services. The current Universal Service Obligation, tied to traditional telephony services, is not delivering in this area. The telecommunications market has presented difficulties in terms of delivering equitable broadband data services, whether equitable across geographic areas or over income ranges or age demographics. Therefore a re-examination of the delivery of universal communication services should be undertaken. This paper has suggested adopting Sen?s capability framework to better address the needs of everyone to utilise communication services. For this, a number of elements would need to be included, including guaranteeing a defined data service available to everyone, obligating quality standards on fixed networks, extending mobile coverage, targeting funding programs for essential equipment and service costs, ensuring that services delivered online are appropriate, and that consumers are confident users of the enabling technologies. In short, it is important that citizens can achieve contactability. Grant, A; Raiche, H. 2012. ?Chapter 7: Consumer protection and universal service?, Australian Telecommunications Regulation, 4th Edition. Ed: Grant and Howarth. Communications Law Centre, UTS. Sen, A. 1999. Development as Freedom. OUP, Oxford. Software Defined Networking ? Shaping up for the next disruptive step? Shall we hook up the old stuff?